Delhi Subordinate Services Selection Board (DSSSB) invites application for the post of 835 Grade-II, Pharmacist, Legal Assistant, Asstt. Superintendent & Matron under various departments of Govt. of NCT of Delhi and its autonomous bodies. Apply Online before 21 November 2017. For Grade-II : Degree from a recognized university in Arts/Commerce/Science or Agriculture. For Pharmacist : 10+2 with Science Subject and Diploma in Homoeopathy pharmacy of not less than two years from a Government Board/institution. For Legal Assistant : Bachelor degree in any subject with Bachelor’s in Law from a recognized university/institute. For Asstt. Superintendent : Bachelor degree from a recognized university. For Matron : 10+2 or senior Secondary pass from a recognized Board. DSSSB Selection Process : Selection will be based on Two Tier examinations, Tier I exam to be used for short listing only. Selection will be made on the basis of marks obtains in Tier II Examination. 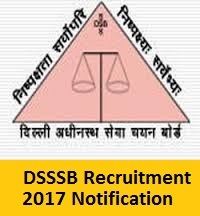 How to Apply DSSSB Vacancy : Interested Candidates may apply Online through DSSSB website www.dsssbonline.nic.in from 01.11.2017 to 21.11.2017.